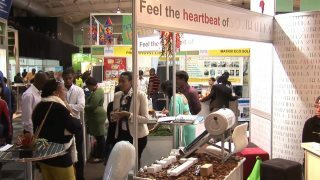 AFRICANGLOBE – SAITEX, the Southern African International Trade Exhibition, is Africa’s biggest business opportunities event, and turns 21 this year. And in true SAITEX style, this massive expo continues to deliver more products, more possibilities and more business opportunities for importers and exporters, aspiring and established business owners, traders, agents and entrepreneurs across Africa. With close to 1,000 exhibitors from 45 countries visiting the expo is bound to pay dividends. Chinese machinery manufacturer Yongkang Jinhan Industry and Trade Co Ltd will be exhibiting its high quality garden and agricultural machines at SAITEX. Its range of products includes brush cutters, chainsaws, hedge trimmers and water pumps, and these are all popular models in China’s domestic market and abroad. “We are keen to establish business relationships with some local agents and clients in South Africa,” says sales manager Connie Zhou. Casa Brasil has been exhibiting at SAITEX since 1999 and is back this year to introduce a Brazilian chocolate manufacturer, Bel Chocolates. The company’s products are exported to over 30 countries around the world, mostly in hot regions, and will be completely new to South Africa. “In general chocolates are very sensitive to heat and in smaller shops you only find chocolates in fridges. These chocolates do not need to be refrigerated, and will be available for viewing and tasting at SAITEX,” says Casa Brasil export/import manager Jose Dias. SAITEX is offering business workshops to visitors covering ‘Export/Import for Beginners’ and a ‘Set up Business Success’ conference. The Export/Import Workshop will cover a full introduction to the fundamentals of trade for beginners. The workshop will take place at SAITEX on 24 June. The Set up Business Success conference will focus on inspiration, knowledge and coaching for small business entrepreneurs. The conference is presented in association with Succeed and will take place on 23 June. To celebrate 21 years of ongoing success for SAITEX, visitors and exhibitors will receive free digital copies of Italy’s leading English language online trade magazines; Household Appliances World, Electrics and Domotics, and Lighting Design World. Simply register on the EMS website at http://www.exhibitionsafrica.com/ on the visitor registration tab. Visitors who pre-register can also use the free business matchmaking service, a popular and highly effective online resource which enables exhibitors and visitors to pre-arrange meetings with pre-selected people online, weeks before the show.